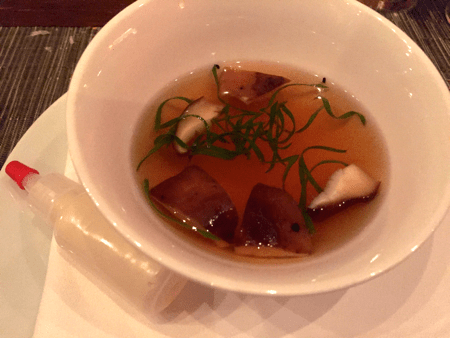 When chef Wylie Dufresne opened his restaurant wd~50 in 2003 he unwittingly sowed the seeds of his eventual demise. 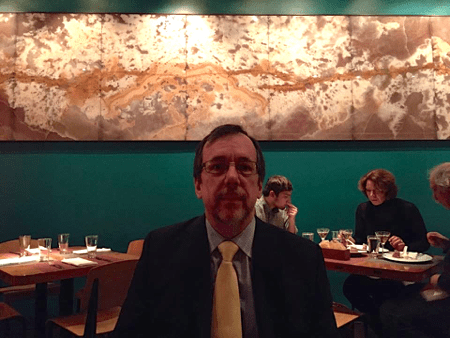 Choosing Clinton Street in Manhattan’s lower east side was a clever move, in that the rent was cheap due to the sketchy neighborhood, but the restaurant was so good that the area improved due to the influx of tourists. 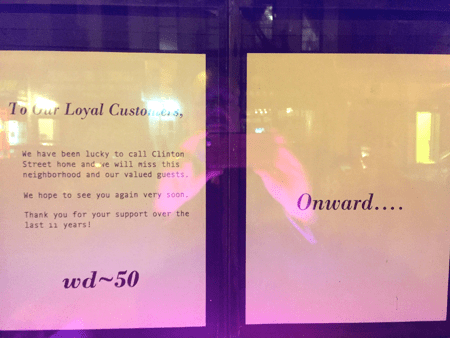 That stretch of Clinton Street is now so valuable that the restaurant will be demolished, to be replaced with an apartment building. Irony. When I heard that they would be switching to ticketed reservations for November, their final month, and that the last week’s seatings would be a “classics” or “chef’s favorites” menu, I was determined to get a table for my birthday dinner. As luck and some furious clicking would have it, I managed to land a table at 7:30 on the night of my birthday. 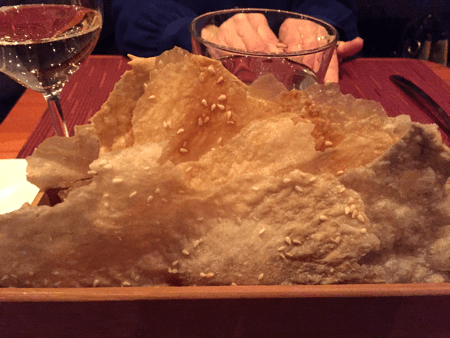 Our first indication that the menu would stray from the ordinary was the bread service, a box of paper-thin sesame crisps. These were so good that She Who Must Be Obeyed asked for a second batch to take home. I’m hoping to reverse engineer them. 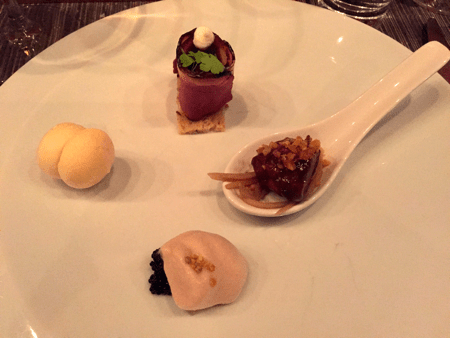 Four amuses presented on one plate: a shrimp macaron with wasabi filling, corned duck breast on a rye crisp with mustard and horseradish, caviar with honey and a Guinness foam, and fried sweetbread with julienned king oyster “noodles.” The duck was clearly the best bite on the plate. 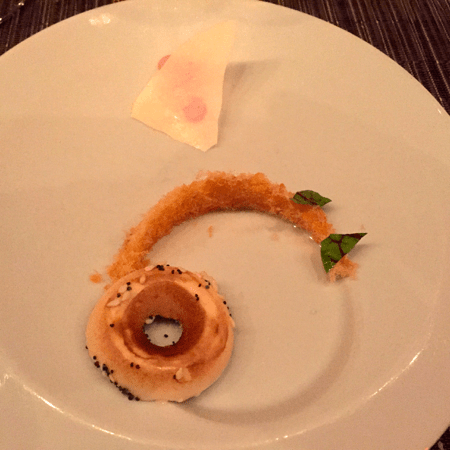 A round of bagel-infused ice cream with poppy and sesame seeds, shredded dried smoked salmon, a piece of dehydrated cream cheese, and pickled red pearl onions. Taken in one bite, it tasted exactly like a bagel with lox, cream cheese, and onions. 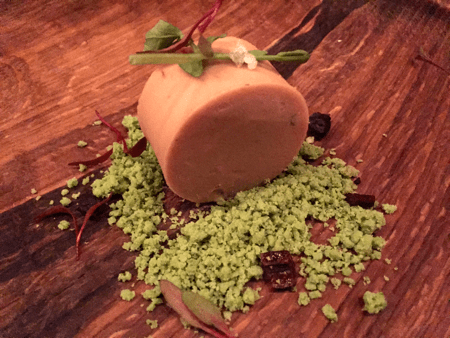 When I cut into that perfect round of foie gras, I discovered that it was filed with beet-citrus gelée, a clever play on the usual sweet compote accompaniment. The sake pairing was inspired, much more subtle than the usual blast from a sweeter white wine. This is the dish I’m still thinking about two weeks later. Sous vide egg yolk cylinders garnished with chives and Canadian bacon chips, and cubes of fried hollandaise in an english muffin crust. When you bit into a cube, it was crunchy on the outside, but still hot and liquid on the inside, the result of some very clever manipulation with hydrocolloids. 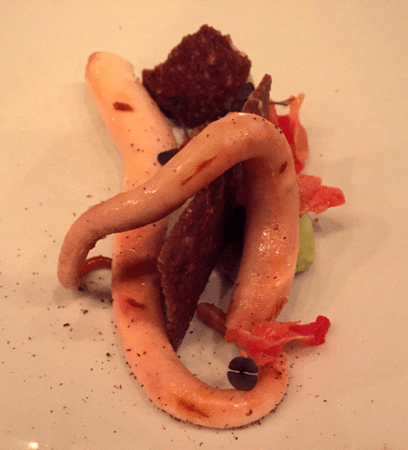 The octopus was cooked sous vide until tender, then finished on the grill – smoky without being chewy. 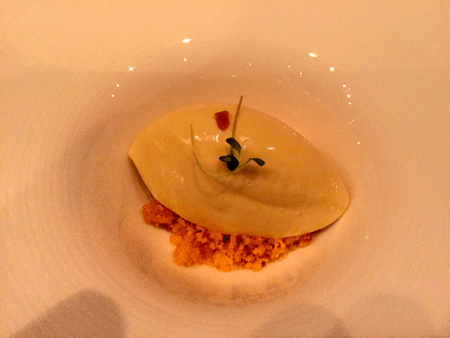 It was garnished with a juniper crisp, avocado mousse, and shaved lychee that has been compression-infused with Campari. I knew the trick behind this dish: The sesame paste was mixed with methylcellulose, which gels at high temperatures. Adding it to the hot soup made it solidify. 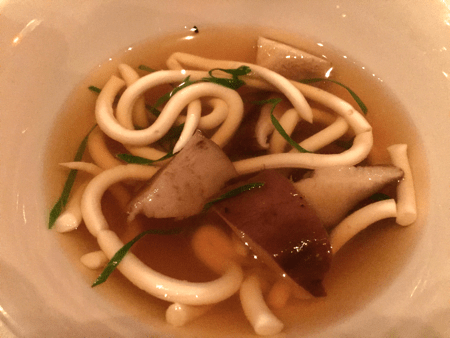 If the soup had cooled to room temperature, the noodles would have dissolved, but it tasted too good to let that amount of time pass. 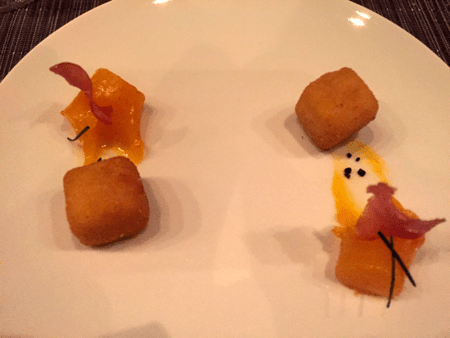 It was during the wine pairing for this course that I sat up and took notice. We were being served a rare chardonnay out of a magnum bottle, and when I asked to have a closer look at the label, our server informed us that they were emptying out “all of the good stuff” from the cellar. 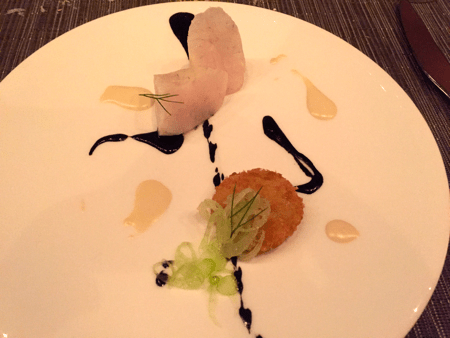 This was not the first pairing of fish and licorice (this was) we had tried, so it was less of a surprise but no less delicious. 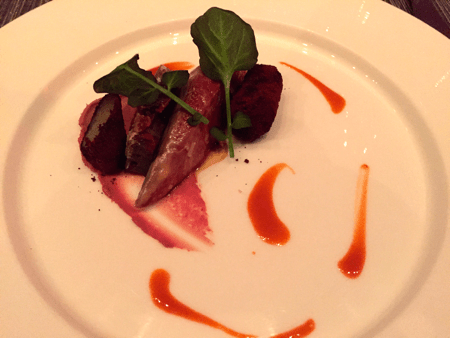 Squab breast with squab confit, yellow beets costed with sweet potato ash, and blood orange sauce. I wanted more of this. Who am I kidding? I wanted more of everything. Cornbread ice cream over a cornbread crumble. This dish was invented by Christina Tosi before she moved on to run Momofuku Milk bar. 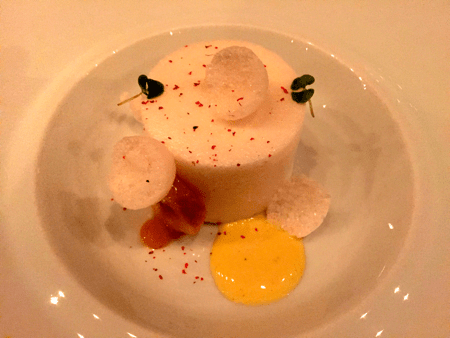 An obvious parallel to the foie gras course, the meringue was filled with passionfruit puree, garnished with crispy meringue and banana sauce, and dusted with star anise and pink peppercorn. 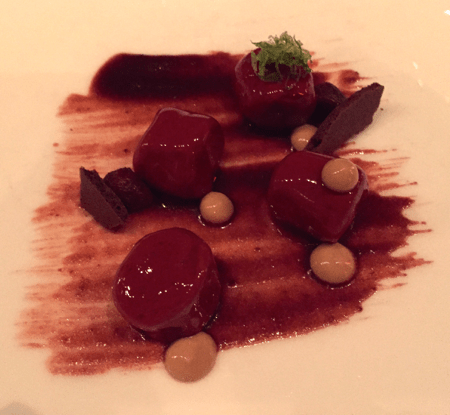 These cylinders of chocolate mousse were covered with cherry gel, an inversion of the standard chocolate cordial. 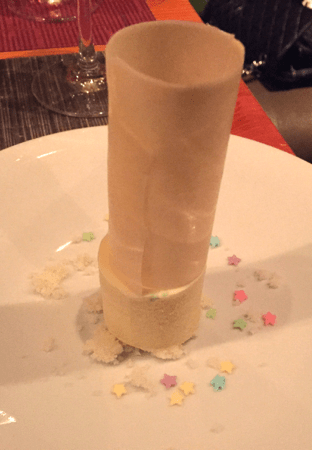 She Who had informed the kitchen that it was my birthday, so they presented me with a (mostly) edible candle: a vanilla ice cream base supported a candle that was covered with a white chocolate tuille shade. 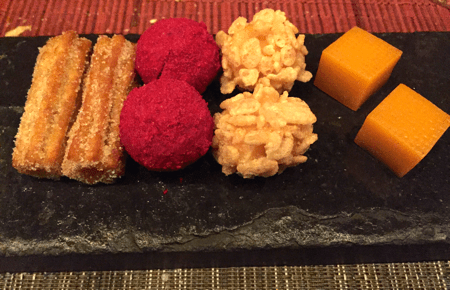 From right to left: Creamsicle chews, Rice Krispie ice cream bon bons, Raspberry-chocolate truffles, cinnamon mini-churros. 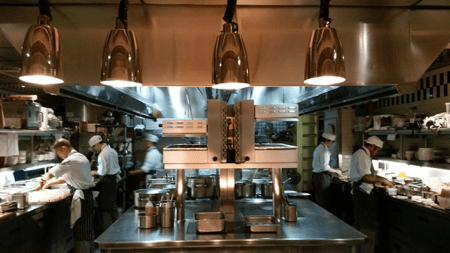 What differentiated this kitchen from others I’ve toured wasn’t the high-end Bonnet stove or the row of immersion circulators – it was the “wall of powders,” the collection of hydrocolloids and other texture-modifying agents, the use of which made Dufresne a pioneer. When we were introduced to the chef, I mentioned that we had met a few years previously at his Harvard lecture. He said “I had a great time there, but they haven’t invited me back. Could you put in a good word for me?” I’ll get right on that. It’s no stretch for me to rank this dinner as one of the top five best meals I have ever eaten. The presentations were clever and designed to surprise, but they were always secondary to flavor and texture. There wasn’t a single off note the entire evening. This entry was posted in food & cooking, influences and tagged food. Bookmark the permalink.